Near total wipe-out, in other words. Not a good look, or a great base to move on from – each new CEO or form of governance believed they were doing a better job than the last, after they set about addressing what was wrong with the former. It’s gotten so old – I can only imagine what staff have been through. Something new did emerge from the hubbub, however – Canning now has a council shot through with political party memberships and affiliations, and councillors who either have, or I suspect will, run for parliament and/or run again (and again). Let’s face it, councillors now get four times the money of just three years ago, and a four-year term in local govt can be enough to pay for a parliamentary run*. It’s my belief the politicisation of Canning may be a factor in what appears a growing imbalance in how it is governed. After five years spent “fixing Canning” the fact there’s any sense of that is staggering. 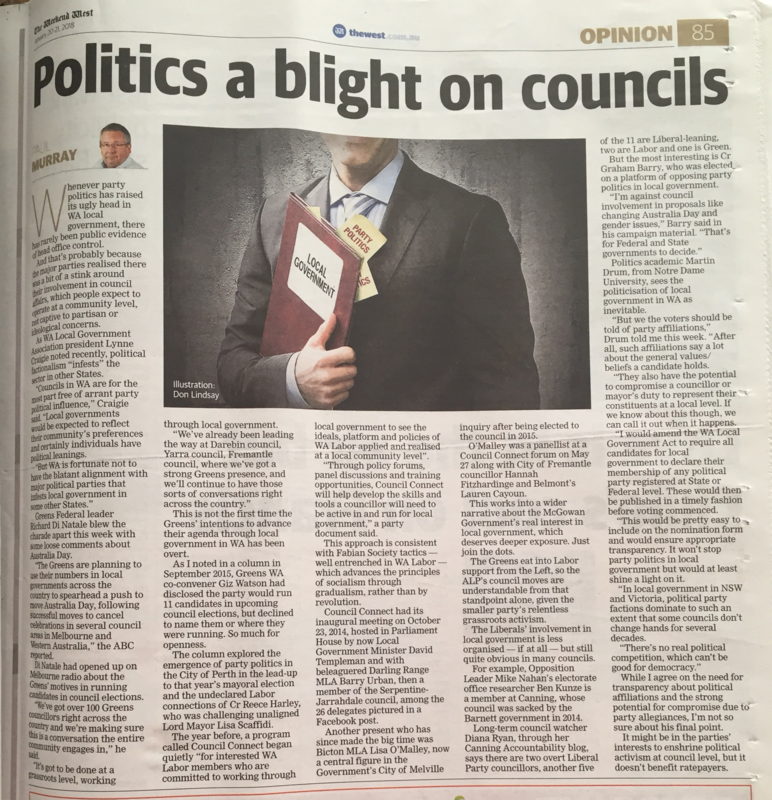 The Weekend West has just published observations about the growing politicisation of councils, and respected political commentator, Martin Drum (Notre Dame University) feels we need to address this now. Or click on below to enlarge (magnifies twice). “Politics a blight on councils” published in the Weekend West on Saturday 21 January 2017 and article appeared via PressReader on same date.